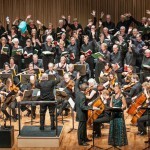 "…it was generally impossible to tell that it wasn’t a fully-professional orchestra…"
Critic Jim Pritchard, writing for the ‘Seen and Heard International’ website, was bowled over by the concert performance of Die Meistersinger von Nürnberg in Saffron Walden on September 14th – including SASO’s impressive playing. “The Saffron Opera Group ambitiously began big with this concert performance of Richard Wagner’s 4¾ hour ‘romantic comedy’, Die Meistersinger von Nürnberg. “The original idea for the company came from Professor Michael Thorne, the vice-chancellor of Anglia Ruskin University, who is a passionate Wagnerian. For each of the past 12 years, he has conducted a Wagner opera, including two complete cycles of Wagner’s Der Ring des Nibelungen, in Portobello Town Hall in Edinburgh. There, rising young international singers hoping to make their names, are invited to sing the leading roles together with local soloists and chorus. Following Professor Thorn’s first visit to Saffron Hall, he was so impressed that he became determined to perform Wagner there it but felt that, as a first class professional venue, it demanded a cast of singers already established in Europe’s major opera houses. One of the singers involved in his Edinburgh performances was international soprano Elaine McKrill who acted as SOG’s casting advisor.